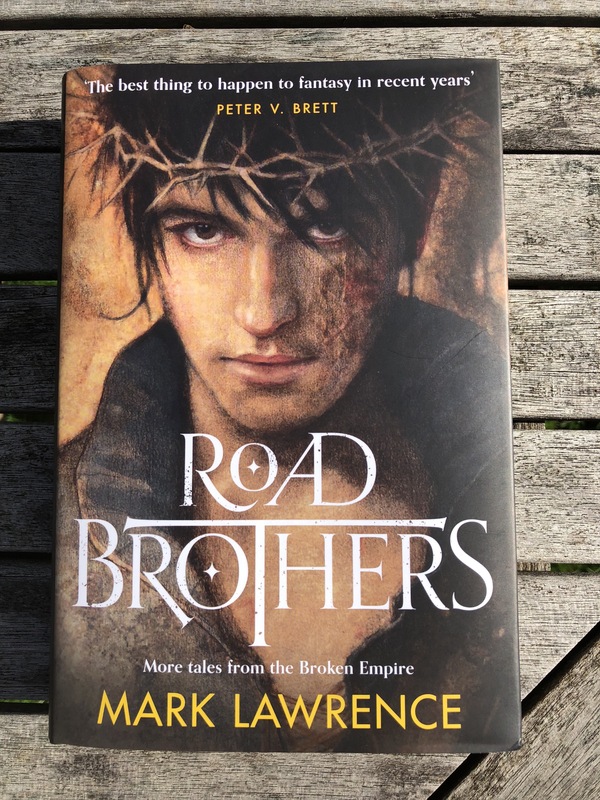 To enter this giveaway and win a dedicated copy of Road Brothers please comment under this post, naming three Mark Lawrence characters (and an optional character by an other author) you would visit a specific destination with. This destination can be any place you’d like, real or fictional. For example: I would go with Jorg Ancrath, Jalan Kendeth, Sister Kettle and Tyrion Lannister (from ASOIAF) to the Tower of Babel (as in the Books of Babel by Josiah Bancroft). Mark will randomly select a winner on Friday, 13th October 2017! In Australia and New Zealand readers should be able to purchase it in hardback published by Voyager! I’d take Jalan, Snorri, Dr. Taproot and Locke Lamora to a Karaoke Bar. Olidan Ancrath, Sageous, Prince Orrin and Joffrey. To the woods! Anyone else you want killing for a book? I would bring Kara, Miana, Chella and Chani of Arrakkis to Camorr (of Lies of Locke Lamora) to start a goddamn terrifying gang. I’d take Jalan, Garyus, Abbess Glass, and Tehol Beddict from Malazan to Wall Street! Jorg, Jalan and Chella to Disneyworld, with The Bloody Nine for company. I’ll go with Jorg, Nona, the young Red Queen and Sebastian (from Jen Williams’ ‘Copper Cat’ series) on a treck through the woods – mostly chatting – , ending up in a nice pub with comfy sofas. I’d take Katherine ap Scorron, Lisa DeVeer and Marya Senlin from Josiah Bancroft’s Senlin Ascends together with Makin to be the perfectly entertainingly gentleman chaperone. We’d all go to Camorr – a city where anything is possible. What can I say, except that I have a fondness for strong leading female characters – especially red heads. Any time more stories of Jorg and his brother are available is a time to celebrate and raid towns!! I would take Jorg, Red Kent, Sir Makin, and Hannibal Lecter to U.S. Outpost #31, the Antarctic research center in the movie The Thing. I would take Nona, Alicia Kenneth, the Nuban and Marith of tCoBK to The San Diego Zoo. My dearest Jorg, I am writing you this letter to inform you that I am going to attempt a campaign through the wardrobe into a land called “Narnia” and I am hoping that you will not interfere, as I am not inviting you to come along (we can’t have two princes on one journey, right?). I am writing to inform you, though, that I have asked several of your acquaintances to join me on this journey and in writing I hope you will give me your blessing, although being a prince myself, I really feel it is up to them to make their own decision…aka don’t interfere and screw it up, brother. Gorgoth- I hear there is a witch who employs monsters in her service, and I have decided Gorgoth would act as a good choice for liaisons between her crew and ours. Gog- I have also heard that this land in which we seek to find adventure is in perpetual winter and I feel the youngster would be very helpful in keeping us warm and destroying winter magic. Sindri- Yes, I know, but whatever. He is as much my friend as yours, and his skills in the frozen lands will be very useful. The fifth member of our party is someone you may or may not have heard of. His name is “Herr Felix Jaeger” (Black Library: Gotrek and Felix series) and he is a fine keeper of adventures by way of the written word. I have enjoyed reading of his adventures, and from all accounts, he is also handy with a sword, which as you know, is always welcome in any adventure party. I hope this letter finds you in a time of leisure and happiness, and I hope you will agree that I have made the right decision in choosing my team. p.s. Upon my safe return brother, we must get together. I have found an artifact that I think you might be interested in. Until then, may our swords find their mark and others’ blood,not ours, runs freely. This was awesome to read! I’d take Jorg, Gog, & Snorri to the White House and start a debate. Jalan, Locke Lamora and Kvothe…. That would be a helo of a trio – A bard, a thief, and a coward. I would go with Jorg and Will Ancrath, the Nuban and Oberyn Martell to the real heaven to see them give them hell. Jorg, Jalan, Snorri and Rezkin (Kel Kade, King Dark Tidings) are flying to the 1st Heartwyld Rock festival hosted by Saga and friends (Nicholas Eames Kings of the wyld) that would be a tale. I would take jorg, gog, and makin and bilbo baggins out for an adventure, I’d love to see where they’d find trouble and wats they’d get out of it. I would take Abbess Glass, Snorri, the Nuban, and Voltron to the Misery (Ed McDonald’s “Blackwing”) on a house-building mission for Habitat for Humanity. I would want to hang out with Jorg, Snorri and Jalan. If Locke Lamora would join we could then check out the Chromeria in the Seven Satrapies and try to free Dazen Guile from his cell. I’ll take Jorg, Snorri, Nona and The Sphinx to Westeros. I expect I shall be Queen of the Seven Kingdoms soon after! How about I take Snorri, Jorg, Sister Apple, and Black Dow to Medieval Times? Jalan, Snorri, Fexler, and Locke Lamora… I’d fly to Scotland for a pub crawl in Edinburgh! I’d take Jorg, TapRoot, and Makin to a 90’s Mike Tyson Fight. We would be ESPN commentators. Sitting in the front row next to the fight (and not far from our table) would be Don King, Jim Carey, Robin Williams, Spike Lee (randomly), And all the Wayans Brothers. Sister Thorn, Jorg, the Silent Sister and Tehol Beddict (Malayan) in the prettty setting of Rivendell. Should be fun. Jorg, Makin, The Nuban and Maha-Sam-atman (from Lord of Light) going to Tanelorn. Taking Jorg, Snorri, and Nona to a Slayer show. I think I’ll go with Jalen, Snorri, Makin, and Gavin Guile to the Orb of Unearthly Delights from Lois McMaster Bujolds Miles Vorkosigan books. I would definitely take Jorg, Jalan and Snorri plus Kuni Garu (The Grace of Kings) to The Bannered Mare (in Skyrim) and just let them go nuts and make a party at that place! I would take Snorri, the Red Queen and the big clockwork soldier along with Druss the Legend (David Gemmell) to Brexit negotiations and put a stop to the whole thing!!! I would take jorg, jalan, shorri and the kaladin from stormlight archives to a hot Mediterranean island ! Dorian, you should be my best man on my wedding.